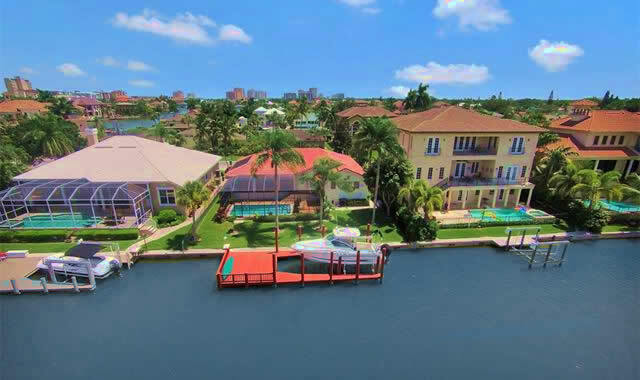 Offering excellent waterfront views, Connors in Naples FL is the largest subdivision of the Vanderbilt Beach community. Its location surrounds the Vanderbilt Lagoon, understandably making it a favorite by boating enthusiasts. A subdivision comprised completely of single-family homes, Connors’ western border is Gulf Shore Drive. With the beachfront condominium communities lining the western side of the neighborhood, real estate in the area is diverse. The northern extreme is Bluebill Avenue, with the eastern being Vanderbilt Drive and Vanderbilt Beach Road, the south. Running off the east and west borders are a total of 17 streets, each a finger extending into the bay. With the Vanderbilt Channel at its northern tip offering an exit to the Wiggin’s Pass Estuary, the Gulf of Mexico is minutes away via the Cocohatchee River. Connors offers single family estate homes of a wide variety of styles and sizes, to suit an equally wide array of budgets. In fact, homes range from 2,000 sq ft to 7,000 sq ft, with some residents benefiting from a 55-slip marina, and other canal-side homes with private docks. Boating is only one of the recreational amenities close to hand for Connors residents. Beach lovers have the pristine sands of Vanderbilt Beach just a stroll away while nature lovers have Delnor Wiggins State Park just a short distance north, where the white sand beach is backed by a lush, untouched nature preserve. Clam Bay Park lies a short distance south along the beach. The award-winning Ritz-Carlton to the south offers superb dining, as do several beach resorts and independent restaurants in the area. There is also excellent shopping available at the Waterside and Mercato malls, and cultural options that include performances by the local philharmonic orchestra at Artis-Naples, in Pelican Bay a few miles south, and the Philharmonic Center for the Arts just a mile further east.